This past weekend I had the opportunity to see effective collaboration in action in Birmingham, Alabama. A team of professionals from Childcare Resources were guided by a competent and caring leader, Amy Bradley. 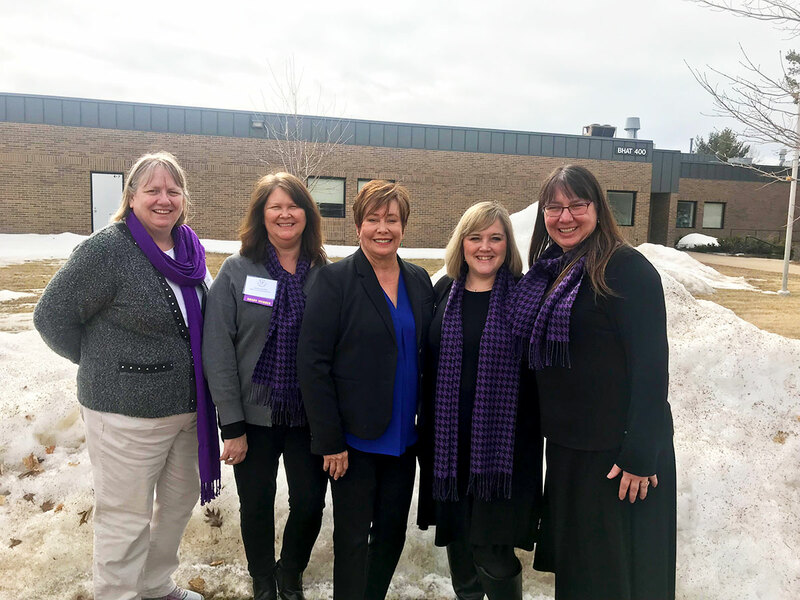 These women worked together to plan and implement a quality conference that provided professional development to many early childhood educators. Collaborative groups share responsibilities, adapt and adjust to changes, and communicate to each other about their important contributions in their roles. It was great to observe all these things occurring during the conference. The participants at the conference felt the positive attitudes of the group, saw their effective organization demonstrated, and appreciated the sessions in the program. 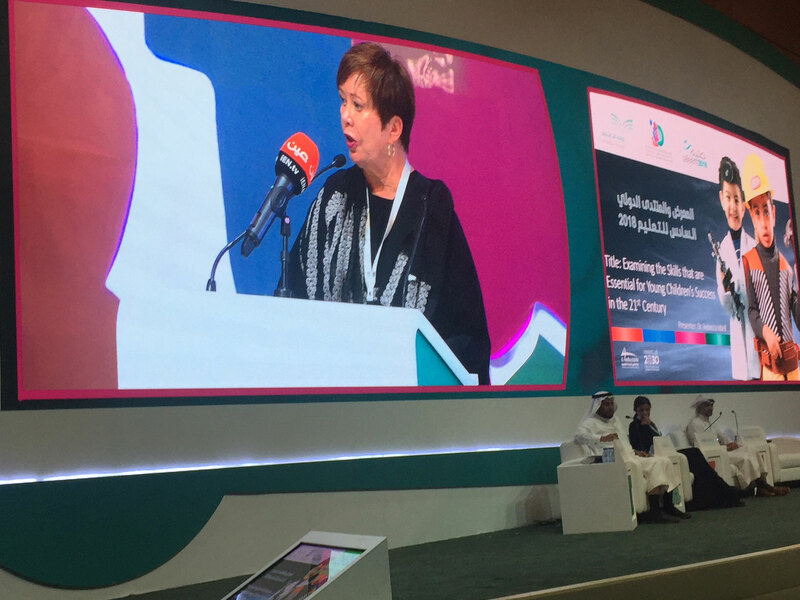 How wonderful it was for me to do the keynote on 21st Century Skills which included the 4C’s – while observing Collaboration working so effectively! As we plan professional development opportunities for your early childhood educators we need to strive to be a collaborative team – just like this fabulous group in Birmingham! Remember the 4 C’s: Creativity, Communication, Collaboration, and Critical Thinking! So, inspired by the quote, I have decided to do something new and different – something I have never done before! I am participating in an ALL ONLINE Conference, “Transform Challenging Behavior” developed by Barb O’Neil. Barb interviewed me and videotaped our conversation which will be shown during the April 3-9, 2019 conference. We discussed the importance of the development of creativity in today’s young children as well as few other topics including storytelling to young listeners. It was an interesting experience, but the knowledge that the video would be seen by thousands was daunting. It is indeed challenging to try something new, but we benefit from the challenge and the experience. Watch me on my very first online conference and let me know what you think and the questions you want to discuss. The conference is free, and it is just a click away! NAEYC 2019 Conference in Washington, D.C.
Join us at an exciting meeting for Early Childhood Professionals where we can reconnect with friends, gain new information, collect amazing creative ideas, and have time to play! Thursday Nov. 15 at 3:00-4:30 in the Marriott Marquis. We will be in Marquis Salon 9/10! Sonia Yoshizawa and I will be sharing the skills that are essential for our Young Children to thrive in the 21st Century. It will a lively time with wonderful visuals, real stories, and lots of laughter. We will also be sharing some unique ideas that can be used in your classroom to spark creative thinking in your children. New studies have identified a frightening decline in young children’s creativity. The challenge is that young children in our classroom today will be living in a very different world with expanded knowledge, new jobs, and challenging issues. We want to nurture our creative thinkers so they will be able to be successful in this changing environment. An essential element in this process is creative teachers who can inspire and value innovative ideas, encourage their communication, and provide opportunities to collaborate. Together we can build on the positive abilities of young children and design a fascinating environment that will support and challenge their creative thinking. Let’s connect and find ways to build creative thinkers! http://drisbell.com/wp-content/uploads/2018/11/naeyc.jpg 593 1200 Dr. Rebecca Isbell http://drisbell.com/wp-content/uploads/2015/12/logo-splash-trans1.png Dr. Rebecca Isbell2018-11-01 16:36:292018-11-01 16:36:41NAEYC 2019 Conference in Washington, D.C. I am thrilled to be providing the Keynote for the Texas AEYC on October 12, 2018 in Galveston, TX! This is like returning to my second home where I can be with all the wonderful early childhood educators I have worked with in Texas. Come by and join me for some positive support for your important work – and find time to share an inspiring story together! I hope to reconnect with my longtime friends and make some new connections with the dedicated early childhood educators in Texas. Please come by and tell me about your latest adventures in the lives of young children! See you soon in Galveston! For over twelve years, I have been working with two professors from Aarhus University in Copenhagen, Denmark. We have visited each other several times, presented together at professional conferences, and written numerous articles and book chapters together. It has been such a rewarding international collaboration for me! This week, I had the wonderful opportunity to be a part of a Celebration for Dr. Grethe Kragh-Müller, recognizing her 40 years of writing in the area of early childhood development. 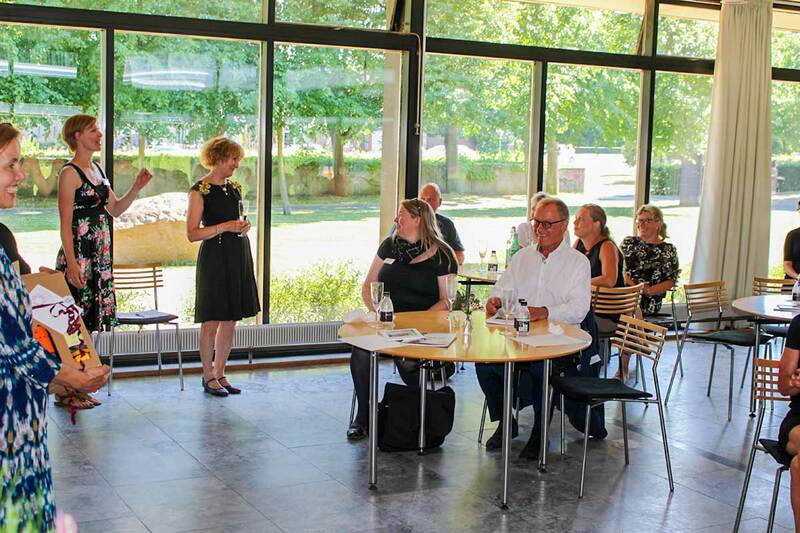 Mira Nymo Wessels, from Børneringen (the publishing company that gave the party), invited me to be the “surprise” speaker for the event. What a joy it was to be a part of this marvelous celebration and to be the guest lecturer! I was able to discuss the international need for Creative Thinkers in the 21st Century and referred to Grethe as a great example of a creative person. 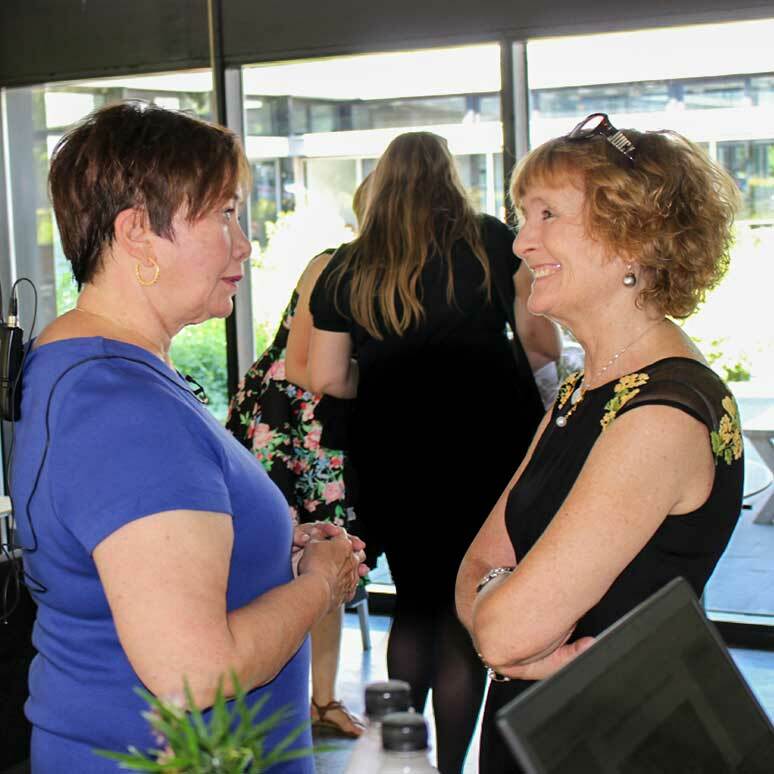 Many of Grethe’s colleagues, area supervisors, early childhood teachers, and friends attended this afternoon event and joined me in honoring Grethe for her important work in our field. Each time I visit Denmark I am touched by the wonderful people who live in this country. I am always amazed how we share so many beliefs about young children and agree on effective approaches for nurturing their capabilities. My work with Grethe and Dr. Charlotte Ringsmore have expanded my global understanding and helped me better understand young children. Although we live thousands of miles apart, we share our beliefs about the potential of young children and our respect for the dedicated people who work with them in America and Denmark. Together we can be a powerful positive voice for young children and those who work with them. April was a very busy and productive month with an amazing ending at Fairfax Futures with teachers who said, “Yes we are creative!” How wonderful to hear that response from a group of early childhood educators! Then on to Central Alberta Early Learning and Care Conference in Red Deer, Canada, with a keynote for family child care providers, many of whom are using my book to implement creative opportunities with their young children. We closed with a “laughing session” that had us all chuckling, giggling, and laughing out loud. What hilarious stories were shared and enjoyed by us all. 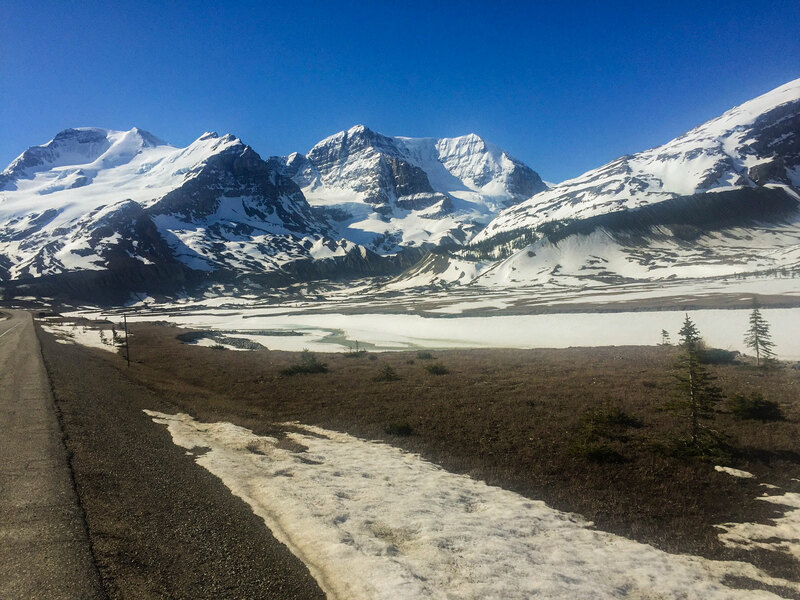 Many of you have heard me say, “Creative minds need rest and downtime.” I had the wonderful opportunity to spend a week in the beautiful Canadian Rockies relaxing, meditating, and regrouping. I returned home invigorated and filled with many new ideas, project possibilities, and ways to spread our mission. We need young creative thinkers, collaborators, communicators, and problem solvers. Help me spread this message as we identity the abilities that are needed to thrive in the 21st Century. An exciting adventure in Riyadh, Saudi Arabia. “Marhaba” – Hello in Arabic. I have just returned from an exciting adventure in Riyadh, Saudi Arabia. 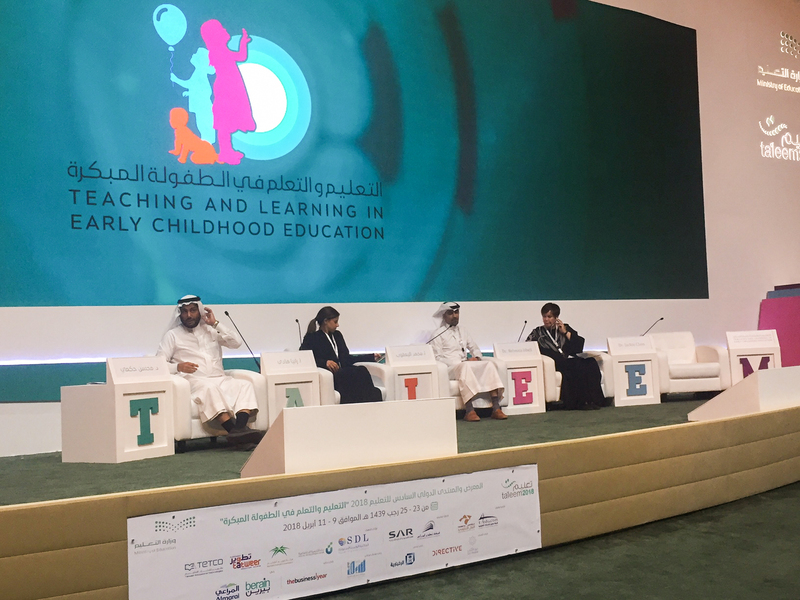 Tatweer Co. for Educational Services, in collaboration with the Saudi government, sponsored the 6th International Exhibition and Forum on Early Childhood Education, “Teaching and Learning in Early Childhood Education, 2018.” It was a great honor to be a part of this outstanding conference that demonstrated the Saudis’ commitment to the Mission of 2030 that includes strengthening the quality of programs for young children in their country. For three days, government officials, administrators, professors, and early childhood educators from Saudi Arabia and around the world shared their expertise related to the importance of the early years in children’s lives, the critical need for quality programs, and the essential element for providing trained early childhood teachers in these environments. 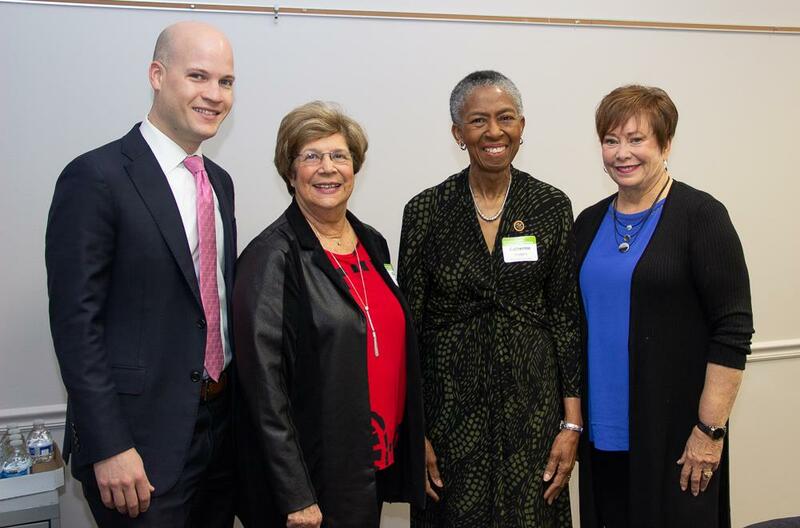 My specific contributions were a workshop on “Investigating Early Childhood Education with an Eye Toward the 21st Century” and serving on a panel discussion focused on the 21st century skills that young children need to be successful in this rapidly changing world. 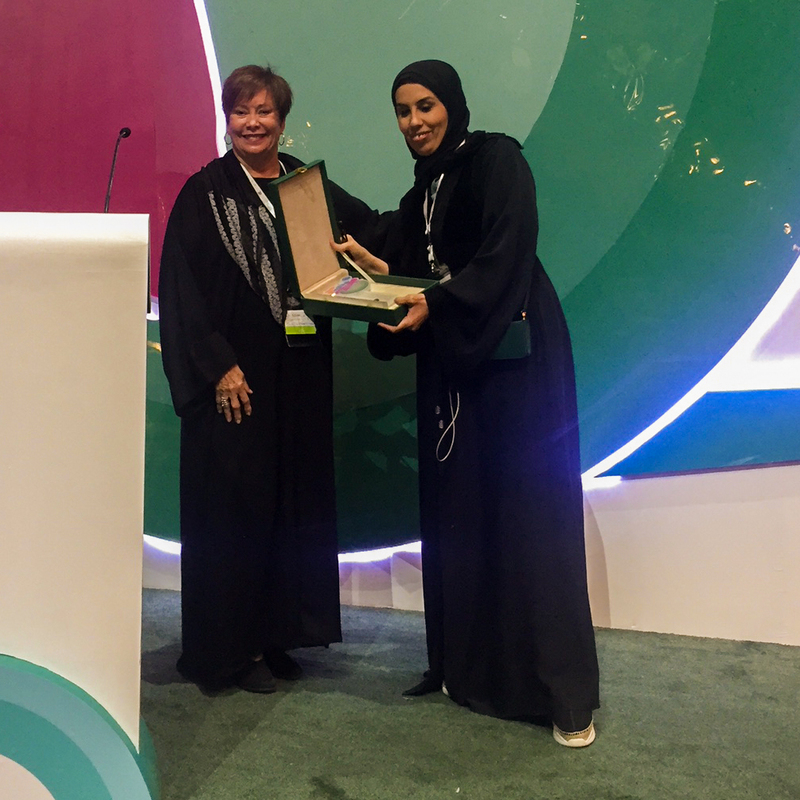 Saudi professionals designed and supported this conference, stimulating participants’ thinking, helping us make important global connections, and recognizing the country’s commitment to young children and their families. I made many new friends and discovered that when we have a shared belief that young children’s learning is the foundation of education, we speak the same language and can work collaboratively for the benefit of all young children – regardless of our varied backgrounds. Jenan M. Alahmed was a positive force at the conference and also the person who supported me throughout this amazing journey. Leaders like Jenan will be instrumental in developing quality curriculum, training, and early childhood programs in this progressive and forward-thinking country. Mabruk (Congratulations!) for having this impressive conference! It was such a joy for me to be a small part of this International Conference on Early Childhood Education lead by Saudi Arabia. 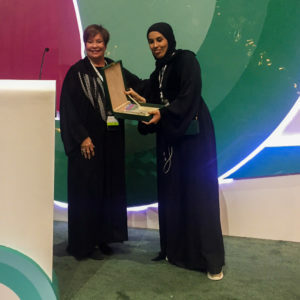 http://drisbell.com/wp-content/uploads/2018/04/saudi-professors.jpg 713 1357 Dr. Rebecca Isbell http://drisbell.com/wp-content/uploads/2015/12/logo-splash-trans1.png Dr. Rebecca Isbell2018-04-18 15:34:322018-10-03 15:05:05An exciting adventure in Riyadh, Saudi Arabia.